If we were to look at the pie chart of activities of my life (which would still be a terrible use of a pie chart because even when looking at proportional representation out of 100% it’s harder to compare the relative sizes of things in that format – death to pie charts) it would be obvious that comic book reading takes up a not-insignificant amount of my time. If we are in a room with this comic book EV needs to run to it and bring it back to me to page through. Spidey who is a girl AND is in a rock band? Is there any better thing in the multi-verse? That meant that EV had a lot of comic books read to her from as soon as she could be propped up to semi-sit-up on her own. Yet, even when she didn’t even have the means to escape from my reading, her attention span wouldn’t necessarily last an entire issue, let alone a whole trade paperback. That changed quite suddenly when I read her Kelly Sue DeConnick’s Avengers Assemble: The Forgeries of Jealousy last summer, a story primarily staring Spider-Girl at its center. EV sat transfixed by the whole thing. She let me read the entire book to her multiple times in one sitting. I didn’t think too much of it – I just love reading DeConnick’s dialog, so maybe that did the trick, which also explained EV staying put in the fall for Captain Marvel, Volume 1: Higher, Further, Faster, More. The realization didn’t hit me until I read her the critically acclaimed, newly-Hugo-winning Ms. Marvel, Vol. 1 (and to E, who lingered in the room, feigning not paying attention but actually listening quite closely). That baby would sit still to read books with female heroines. I tested my theory. Spider-Man? A few pages. Hulk? No interest. Thor? Barely a glance. Storm? Entire issues. The lady version of Thor? Glued to the pages. 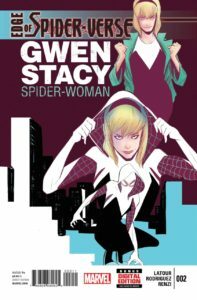 Spider-Gwen? She picks it up every time we walk up to the attic. Hell, one of her first few dozens words was “Lumberjanes” so she could request the comic of the same name (which I dislike; maybe more on that later). Tonight we read the first few issues of Ryan North’s delightful Squirrel Girl (recommended highly for kids!) while EV spent the entire time hanging off of me and giggling with glee. What’s interesting about those books is that they include varying amounts of action and extremely distinct artwork, but they are each about more than a superhero who happens to have breasts. They feature women being women. I don’t mean doing “girl” things. I mean as heroes, their women are distinct in their voices, actions, hopes, and fears from male characters. They could not simply be gender-swapped. The exercise lead me to look through EVs other books with a critical eye. Most protagonist characters in baby books default to male – the female is almost always the mother! And do you know how many books we have that feature a father in something other than a vestigial, dismissal role? Only a handful I can think of – Sylvester and the Magic Pebble, Gaiman’s delightful Fortunately, The Milk, the classic Make Way For Ducklings, and my favorite, Maurice Sendak’s Pierre. However, of those, three of the protagonists are male and three have mothers as the primary female. In case you are ever wondering – representation matters. Even a baby who cannot say a single word will tune in to media with a character she identifies with more readily than one she doesn’t. I didn’t have to run a very length or scientific experiment to figure it out. When we’re asking to see Black Widow on Avengers merchandise or wondering if we could see Miles Morales – a black, latino Spider-Man – onscreen, it’s not just because we like those characters or are demanding diversity for diversity’s sake. We want the next generation of real life superheroes to see themselves in the media we allow them to consume.